The United States Mint has issued proof coinage since the early 19th century, though for the first 100 years or so, production of proof coinage was relatively sporadic, and for some series many years passed without the issuance of a single proof specimen. This changed in 1936, when the United States Mint began issuing proof sets on an annual basis, with few exceptions. Historically, proof coins were minted at the Philadelphia, but this changed in 1968 when production of proof sets was moved to the San Francisco Mint, which places its “S” mintmark on proof coins. Proof sets generally include at least one example of each issue ranging in denomination from one-cent through half dollar, with the one-dollar coin also included during periods when a dollar coin has been part of the regular production lineup. With the introduction of various new coin series in recent years, such as the 50 State Quarters, Presidential $1 coin, and others, the size of proof sets has grown from five or six coins to 10 or more. Proof sets made from 1936 through mid 1955 consist of individual proof coins in cellophane envelopes that are stapled together in a bundle and packaged in a cardboard box stuffed with tissue. In mid 1955, proof sets were assembled in a single cellophane pack shipped to collectors in a manila envelope. Proof sets still housed in their original cellophane packaging, which was used by the United States Mint until 1964, are becoming scarcer over time as collectors break these sets apart to harvest the coins as singles for album-based sets or for submitting coins to third-party graders. 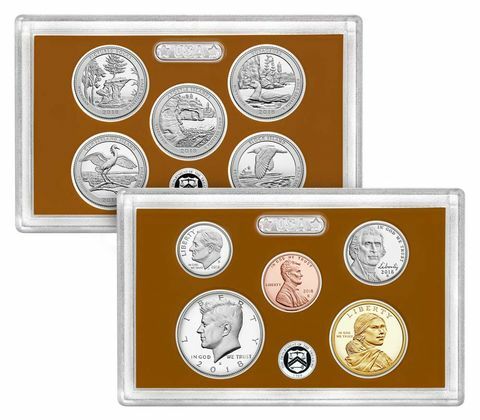 Many pre-1965 proof sets have also been assembled into aftermarket plastic cases. Following a brief hiatus in proof set production at the United States Mint from 1965 through 1967, proof sets were once again offered beginning in 1968 and have since been assembled in rigid plastic lenses that are accompanied with outer cardboard sleeves and boxes. Certificates of authenticity have been issued with proof sets since the mid 1980s. Across the board, proof sets with choice coins enjoy premiums. Cameo proofs were relatively scarce before 1976 and thus sets predating that period which contain cameo proof coins are also worth premiums above typical market values. All pre-1965 proof sets in clean, original packaging generally trade at higher levels than for proof sets that have been assembled in aftermarket holders.